Fujiya Country Ma'am Chocolate Chip Cookies are very popular soft and chewy cookies in Japan. Vanilla and chocolate flavor are the ever classic, but there are some limited flavors such as Matcha green tea. 1. Cream the butter in a large bowl. Add sugar and mix until white and fluffy. 2. Add the beaten egg little by little, and mix well. Add a few drops of vanilla extract and mix well. 3. 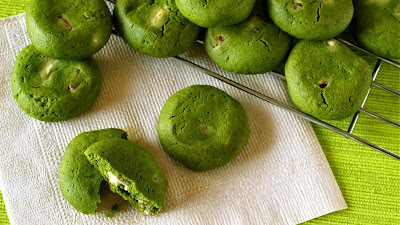 Sift in flour, Matcha powder, and baking powder, then mix well with a spatula. 4. Wrap in plastic wrap and cool in the fridge for about 30 minutes to set. 5. Break the chocolate bars into small pieces. 6. Divide the dough into 25 pieces. Make it flat and place the chocolates. Roll into a small ball. Then press the center of the ball gently with your finger to make it flat. 7. Bake at 170C (338F) for 10 minutes. Cool the cookies on the baking sheet or a wire rack. You can keep the cookies in an airtight container or a Ziploc bag for a week.